This post covers troubleshooting, removal and installation of the windshield wiper motor on a 1998 to 2003 Chrysler Corp minivan. The best way to isolate the motor is to check for 12V DC at the end of the wiring connector on the driver's side of the wiper housing. 2) Splay one fork of a 14-16 gauge spade type wiring connector. Slip the straight fork into the large red and yellow receptacle of the connector. 3) Attach an alligator test clip from the positive on the meter to the splayed fork of the connector. 4) Attach the negative side of the meter to chassis or battery ground. 5) Turn the ignition switch on and turn on the wipers. 6) Look for 12V DC. If present, the motor (or far less likely, the wiring to it) is bad. If not present, the problem is elsewhere such as a fuse, switch, relay or wiring. 1) Remove the wiper arms. Mark the position of the arms with some whiteout on the arm and the long plastic wiper enclosure cover. Remove the plastic covers at the ends of the arms and unbolt with a 15mm socket and ratchet. Tap the end of the stud lightly with a hammer and remove the arms and set aside. 2) Remove the wiper enclosure cover. There are five T-25 screws holding this cover on. Ignore the two Philips fasteners under the end of the arms. There are also four keepers holding the front edge of the to cover in place. Break them free with a 16mm socket and they will lift over the studs. Disconnect the washer line on the left side and pull it through though the hole. 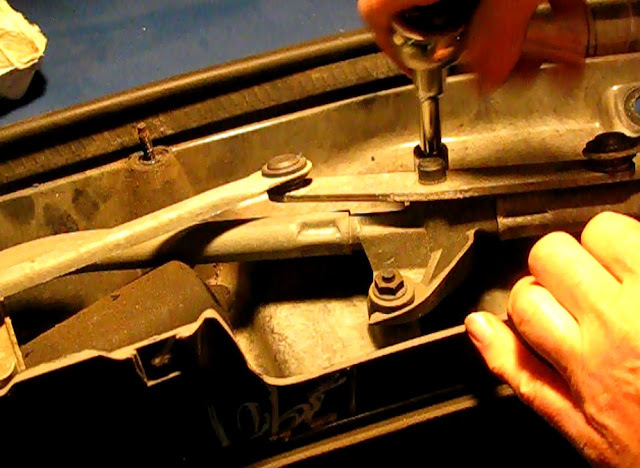 3) Remove the lower wiper enclosure pan. Disconnect the wiper motor. Disconnect the two water drains at the left and right ends of the pan. Unbolt four 10mm nuts on the windshield side of the pan. Unbolt five 13mm bolts along the firewall. Lift the pan up over the studs on top and remove. White arrows are two of the 10mm bracket bolts. 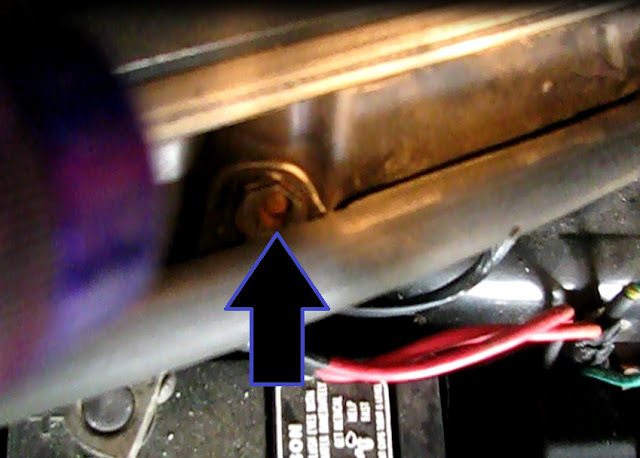 Brown arrows are two of the 13mm mounting bolts. 4) Place the wiper pan on a workbench or table. Remove the four brackets that span the top of the pan. They are held on with 10mm nuts on the firewall side of the pan. Mark them with a marker or tape to make sure they go back in the same position. On the other side they are closely fitted over a protruding tab, with a knob on the underside of the bracket pressed over the plastic or fiber front part of the pan. Take care not to break anything off the pan with too exuberant a removal. 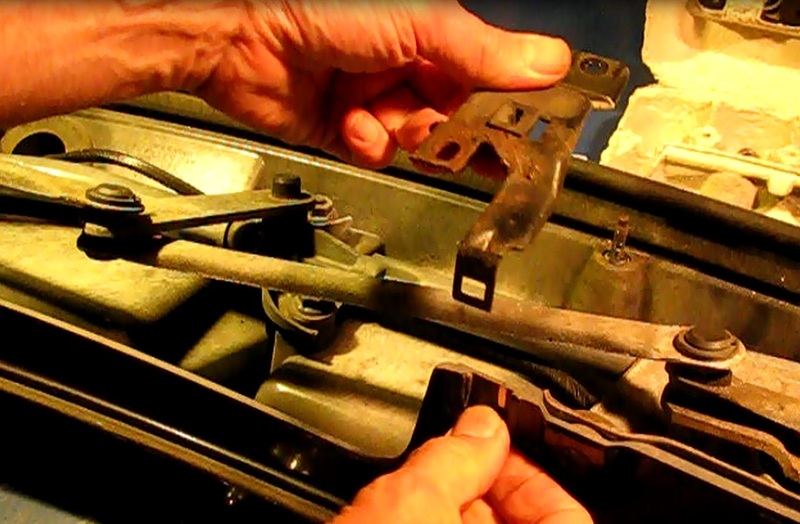 5) Remove seven 13mm bolts holding the wiper assembly to the pan. 6) Turn the wiper assembly over and unplug the two wiring connectors from the motor. 7) Turn the assembly over again and break the 13mm nut holding the motor output shaft to the wiper linkage. Take care here to mark the position of the linkage relative to the pan with a marker to ensure that it goes back in the right position. Tap a 13 mm box end wrench with a hammer to break the nut free. Turn it out a bit. It will top out on the linkage. 8) Remove the three 10mm motor mounting bolts. 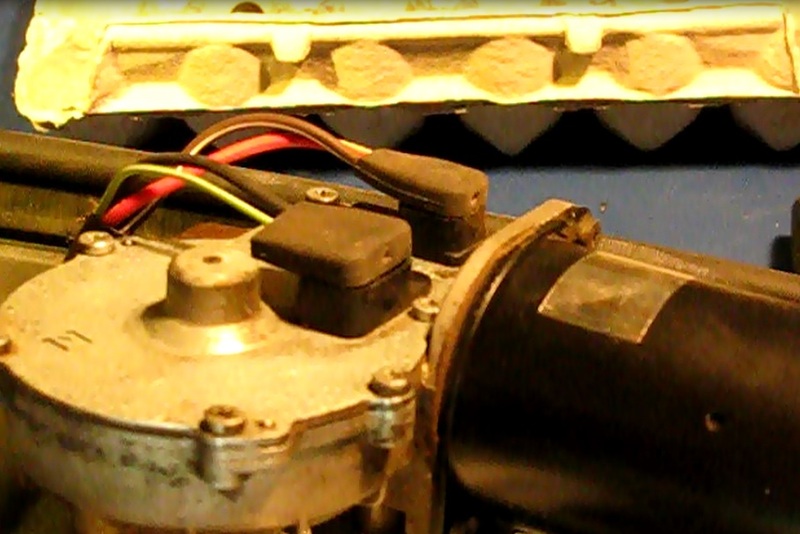 1) Plug in the replacement motor. The linkage is still upside down. 2) Turn the assembly over. 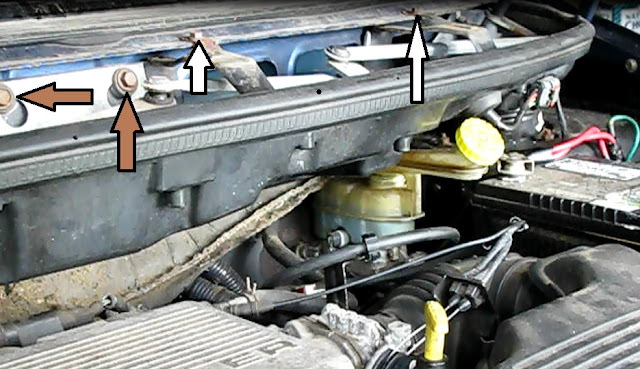 3) Use your mark on the wiper linkage to orient it just the same as it was originally. 4) While holding the linkage in place seat the motor in the linkage. 5) Turn the nut on first and when in far enough to hold in position, alternately mount the 10mm mounting bolts. When in all the way, tighten the linkage nut. 6) Mount the six 13mm mounting bolts. 7) Re- mount the four brackets, making sure they go in their original positions. 8) Install the lower wiper pan over the studs by the windshield. Make sure to plug in the wiper motor and re-connect the drain hoses. 9) Install the upper wiper housing cover. 10) Install the wipers, making sure the marks made earlier align. 12) Run and test the wipers. The motor hums but the wipers don't move. Could it be just the bushings and causing the wiper arms to get stuck?